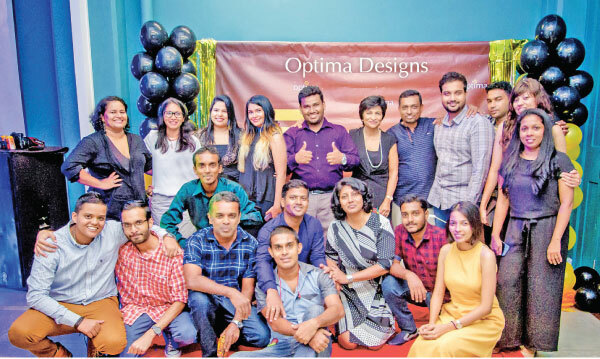 Optima Designs Pvt Ltd, the print design agency with a flair for unconventional design solutions for any and every type of printed matter, celebrated its fifth anniversary recently. 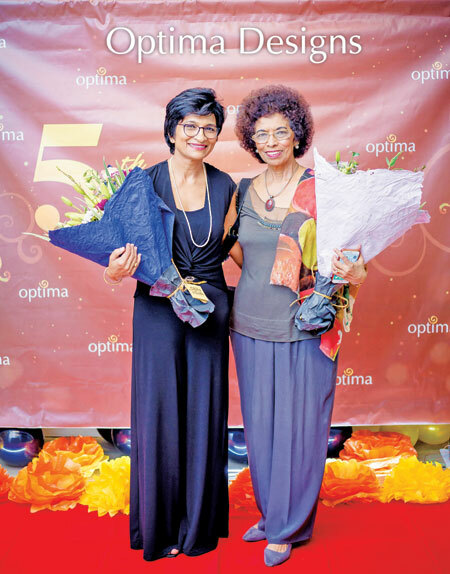 Under the theme ‘Optima Superheroes,’ the Optima team gathered at Hatch Works Colombo, to commemorate an unforgettable journey that started from a germ of an idea between Anjum Cader, a seasoned print solutions specialist, and Sri Lanka’s advertising legend, Lilamani Dias Benson. This potent combination of business acumen, advertising industry experience and an innate talent for creativity, backed by a small but dynamic team of 12 young-men and women, saw the birth of a whole new generation of print design solutions in Sri Lanka. Team Optima, which has continued to grow to 19 members over the past five years, celebrated their origins and their evolution at an evening of fun, food and festivities, accompanied by their nearest and dearest to share the joyous occasion. The Directors of Optima Designs also took this opportunity to recognize and acknowledge the contributions of its oldest superheroes, with gifts and service awards. “Tonight we celebrate the first Optima Team who took that leap of faith with us. You have more than kept the faith! You have created beautiful work that leaps out of the ordinary that understands and enhances our clients’ aura. And as we grow and glow, with an ever expanding team, may the Optima brand always Optimize Opportunity and unfailingly reach for excellence,” said the Chairman of Optima Designs, Lilamani Dias Benson. 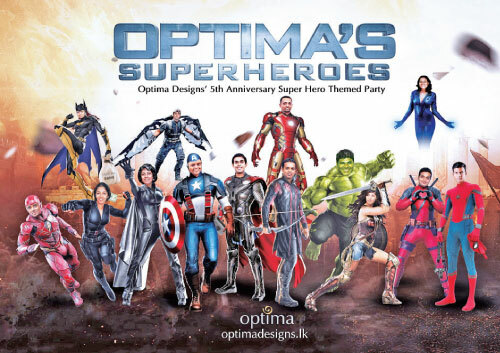 “I feel fortunate to honor all the superheroes in Team Optima and to celebrate our 5th anniversary with our families coming together to mark this milestone year and we are equally determined to pledge ourselves to seeing through another exciting 5 years getting more creative in our design industry!,” said the Managing Director/Chief Executive Officer of Optima Designs, Anjum Cader. Making waves from its inception in 2014, Optima has already made a name for itself in the specialized arena of annual report design and publication and has continued to capture the hearts and minds of its audiences, with print design solutions for the full range of printed documentation that are not only exceptionally artistic but are also highly creative both in application and visual form. Optima Designs’ annual reports, for instance, have spanned the boundaries between traditional print publications and the digital realm by introducing virtual reality technology into printed annual reports and has won numerous awards for its annual reports year-on-year, demonstrating the quality of its report compilation. Embracing, the exciting new digital world, Optima Designs has presented to Sri Lankan companies a range of new digital design applications from digital reports, to a variety of digital corporate communications material, for the Internet and smart phones. From its initial unknown beginnings, the company has surged ahead to expand its client portfolio and extending its reach across divers economic sectors and industries from plantations, to manufacturing to services, becoming one of the fastest growing print design service providers in the country. With an attitude of continuous improvement the Optima team too, has grown and become stronger through the inclusion of new talent and exposure to training and education. With a multi talented, creative and motivated team, Optima Designs is on high gear to take Sri Lanka’s print design industry to new heights and Sri Lankan institutions and individuals can expect nothing less that super solutions, whatever their digital and print design requirements. The Optima Superheroes are ready and armed with a full portfolio of innovative, multi disciplinary design solutions that bridge the digital divide and make print design non-traditional in every way.